Which is better. Prefinished hardwood flooring or site finished hardwood flooring? Well, there are pros and cons to both. Prefinished hardwood flooring is a wood floor that is finished at the factory. Unfinished hardwood, whether engineered or solid hard wood, will have a urethane finish applied at a finishing facility. This urethane wear layer will be infused with aluminum oxide and UV cured. This system produces a very hard finish that is resistant to scratching and gouging. This type of system will provide the hardest surface for a residential hardwood flooring job. A site finished hardwood floor will consist of an unfinished solid wood floor of any wood species installed. After installation of the unfinished wood floor, the floor will be sanded down and sealed. After sealing the floor, 2 or more coats of urethane will be applied to finish the floor. One advantage to this type of system is the floor itself will be totally sealed (at least at first it will be). This keeps water from getting between the boards which can cause damage. As time goes by and seasons with varying humidity levels pass, the wood floor itself will expand and contract causing cracks between the individual boards. Now the floor is no longer totally sealed from the top and probably negates the only advantage to this type of wood floor. Another advantage of a prefinished hardwood flooring product is that the finish is already applied and dry so you can walk all over it once its installed. A site finished product will take days to completely cure and most people will have to stay out of their house during the finishing process. This can be very inconvenient. Lastly, unlike in the past, prefinished hardwood flooring is more cost effective. It costs less to install a prefinished product than it does to install, sand down and finish an unfinished wood floor. So overall, I would almost always recommend a prefinished wood floor over a site finished wood floor. 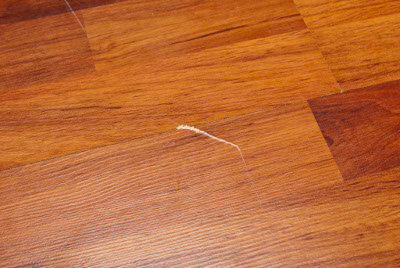 If you have a hardwood floor then you know how it can be when you get a surface scratch, dent or chip. I would say that every hardwood floor in everybody's house will have surface scratches. Maybe a dent or two when you dropped that can of corn on your floor. Or gouged your wood floor when you dragged something across it. Maybe even a chip out of the edge of one of your planks. If you have surface scratches that only scratched into the urethane surface, there really isn't much you can do short of refinishing your floor. If the scratch went through the surface and into the wood than you can purchase a wood repair kit. The wood repair kit should contain at least a couple of stain sticks, wax filler crayons and a small bottle of urethane among other items. With a small surface scratch you can try the urethane and see if that will fill it satisfactorily. If not then a refinish will probably be the only way to fix these. Remember, every wood floor will get surface scratches and is normal. I wouldn't recommend a refinish until the top wear layer is showing considerable wear (but not worn into the stain. Try to refinish before the surface wear wears into the stain layer). With a surface scratch that has penetrated the stain layer then a stain stick will fix the problem. Just apply the stain to the deep scratch. 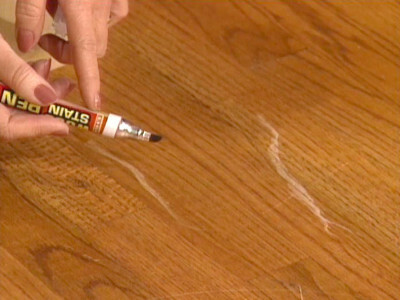 Make sure you use a stain stick color that comes as close as possible to the color of your existing floor. This should do the trick to hide the scratch. You can apply a thin layer of urethane to the area after it dries if you want. uge is completely filled with the wax. Then rub the surface to smooth out the wax filler until it blends in with the surface height. Again, use the correct color of wax filler so as to blend in the best. You can also fill in chips that have occurred in the edges of the boards with the wax filler crayon. If you fill an edge chip, you will need to use the edge of a credit card (or like tool) to "form" the edges to match the rest of the individual hardwood board. These methods will normally repair any unsightly surface issues that accrue over time in any hardwood flooring. Larger issues such as large gouges, large chips or cracked boards can be addressed. If you have a prefinished hardwood floor than you can remove and replace individual boards. Even from the middle of the floor. A site finished product is much harder to repair. Once you replace a board with an unfinished piece of hardwood flooring then you must refinish it to match the existing floor which is very hard to make look good. In fact, most hardwood flooring refinishers will not do a repair like this because the risk of the customer being unhappy with the finished product is very high. This is another advantage of having a prefinished hardwood flooring product installed in your home instead of a site finished hardwood product (along with the fact that a pre-finished hardwood floor has a UV cured wearlayer with aluminum oxide embedded in it which forms an extremely hard finish that you cannot achieve with a site finished hardwood flooring product). These are the most common and easily administered fixes for hardwood flooring surface maintenance!